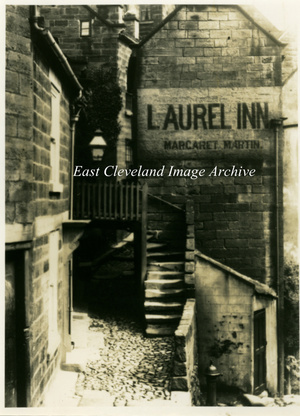 The Laurel Inn at Robin hoods bay, Does anyone know at what date Margaret Martin held the licence? Nicolas Jenni has advised: ”I have a watercolour painting of this view, dated 1894, and the licensee is shown as John Martin”. Further researches have now shown that John Martin was licensee until his death in 1899, Margaret Martin then became licensee and died in 1915. Postcard courtesy of Joyce Dobson & Keith Bowers, many thanks to Nicolas Jenni for the update.